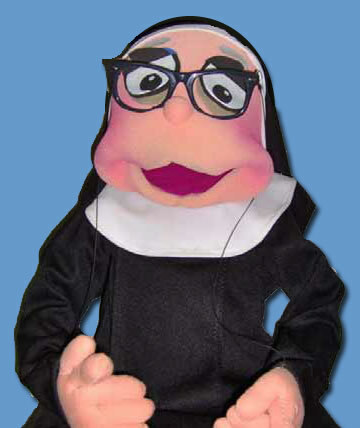 In addition to complete habits, we have costume pieces and some props available for the various "Nunsense" shows. The complete rental package is available for $300 per week and $100 for each additional week. Packages will be shipped and must be returned by Fedex ground at the renter's expense. Click here for a rental inventory of props and costume pieces. Each habit consists of a tunic (robe), scapular, collar wimple, veil, belt, and rosary. (also available for purchase at the store under Category: Show Needs) Black T-shirt, black tights, and shoes are NOT supplied. The habits are completely washable. There is no dry cleaning necessary. Wimples and robes can be altered to fit each individual by the theatre's wardrobe person. We will ship your order UPS 3-day select. Your order will arrive C.O.D. at which time you will be billed for the first week's rental and the shipping charge. You are responsible for returning the order 3-day select at your own cost. Payment for any additional weeks is to be included with the return of habits. is everybody's party favorite! This sassy nun only stops talking when you do. "The 'Nunsense' series of musical comedies have made millions laugh, and have saved theatres from bankruptcy. Dan Goggin knows he has raised the human spirit." © Copyright 2010-2020, Nunsense, Inc. Site by High Point Design. and ArtSiteDesign.com .